In a portfolio model, 1 invention in 200 becoming a commercial product is acceptable, if the 1 is a big hit. In an agent model, 1 in 200 is unacceptable and borders on malpractice or fraud unless inventors willingly turn over their inventions even knowing these odds. Given that Bayh-Dole’s policy objective is practical application, not an increase in unlicensed patents, it would appear that the growth in patents on subject inventions within the “portfolios” of universities points to a failure of the Act. Unless universities can show that the increased patenting leads to increased products on the market from those patents, the observation is that the patenting is diverting what would have been–and ought to be–public domain or commons-based (standards, platforms, and the like) inventions into portfolios to prevent access to university research outputs. The growth in university patent holdings is public information. The burden is on the universities to show that this growth is justified in terms of public benefit on reasonable terms from the use of these inventions. Thus far, it does not appear that universities have data to support such a justification. The number of licenses does not in itself provide that justification. Nor does licensing income. Nor does a woolly-minded and wholly unreliable assertion of the number of jobs created based on multiplying licensing income by the inverse of a typical royalty rate and dividing by the average salary of a technology worker. A provisional conclusion is that universities are spending more on patenting subject inventions, are less selective in what they patent, and are preventing research discoveries from entering the public domain or other commons in favor of a portfolio model of gaining a financial return from patent ownership. We should put this all in perspective. The share of university and nonprofit patents citing a government interest has moved from 0.1% of all patents to 1.1%. That’s relatively a big jump–10x in forty or so years. But in the overall shape of things, it’s still a tiny portion of overall patent activity. Is there something special about university patents than makes them more important than their share of all patenting would suggest? Or is it just the case that these patents are pretty much like other patents, and are pebbles tossed in a big stream of proprietary claims to discoveries? We might add, just for perspective, that we have no estimate on the number of inventions that get made and are not the subject of a patent application, or if the subject of a patent application, the application does not result in an issued patent. If we take into account all such discoveries–and even just the ones that are disclosed–then the share of university and nonprofit patents with a government interest is vanishingly small. It’s difficult to understand how there could be a claim made that these patents, as the result of Bayh-Dole are responsible for any significant, let alone measurable or even detectable change in innovation or economic activity in the United States. It may well be there is an effect that’s measurable–certainly folks have tried to construct “models” for that effect. But taking licensing revenue and multiplying it by the inverse of a typical royalty rate does not begin to detect a signal–all it does is produce a rather random large number, like drawing a picture of a monster. It would be nice to know whether the monster is the size of Tacoma or is a fruit fly stuck in your wine glass. The rise in the middle of this graph, I argue, shows the effect of universities shifting from an agent model to a portfolio model of patent management. They did so on the increased volume of patentable inventions that they easily obtained under their claims regarding Bayh-Dole–they did not have to negotiate for rights, inventors had no alternative but to assign rights (they could not publish nor even choose to publish through the federal government’s patent program of dedication or non-exclusive licensing), and patents could be held for extended periods unlicensed without any threat that the federal government or public could intervene. Bayh-Dole did not create this approach directly. Bayh-Dole, by being a poorly drafted, convoluted law, gave patent brokers standing to be authorities on the law, and patent brokers used that standing to misrepresent the law and cower faculty and other university officials into changing patent policies to support their view of patent management–patent uncritically (and use that patenting activity to demand bigger budgets and salaries), try to “commercialize” (by seeking monopoly partners, often by way of assignments masquerading as exclusive licenses), and when the effort to “commercialize” failed (as it almost always does), to hold patents indefinitely (until expired, or until there is an opportunity to “monetize” the patent by trolling industry or licensing to a startup that has as its fallback plan to troll industry). In this way, Bayh-Dole allowed a portfolio/monopoly/commercialization model to move into university administrations and set up shop, having eaten the brain of administrative management of inventions in the public interest–that is, to separate those inventions which properly might be made available to industry under a patent license and those inventions which should be published or managed in a commons (public domain, non-exclusive pool, or standard). This distinction is now largely effaced. The only visible role for patents is to seek monopoly licenses. This effort is characterized as complex and difficult and expensive and full of risk. And, in reality, it is all these things. But it is not the only approach possible, and not the most productive approach, and not even the most lucrative approach, if money must be the standard of success. The idea that exclusive licensing for commercialization is the be-all for university patent management is bluster. Most products require multiple rights. A car has 300 or more patents. A ink-jet printer has 50 or more. Even prescription drugs can involve 5 or more patents–and more patents to scorch the earth around the class of compounds involved so no one can produce a competing analog. Commercial technology products are often platforms, and around each platform may be scores of patents that prevent others from developing anything similar, and scores more patents held by others that block the platform from applications or improvements in areas controlled by those others. all theory, because most products require multiple rights. The idea that any particular discovery made with federal funding might “become a product” is itself an iffy proposition. A patent might contribute to the functional set necessary for a thing to become a commercial product, but it is rarely the only member of that set. At best, it is a starting point to gather the other members of the set. At worst, it is the basis for preventing others from gathering the set of functions that they need to create a product. Federal research funding for university projects arose after World War 2, fed by Vannevar Bush’s idea that an expanded scientifically trained workforce combined with expanded frontiers of science would create the conditions under which America could improve its public welfare in the same way that it had improved its military technology–by gathering new discoveries of science with existing technology and enhanced know-how to create new products, new services, new companies, and new industries–ones that could not have been imagined by the established professional orders–the military, medicine, or industry or the federal government itself. Bush proposed a National Research Foundation to try to balance significant federal funding with the need for accountability. In that effort, he failed–though from his proposal sprang the National Science Foundation as well as a rush to support research across the agencies of the federal government, creating the conditions under which it would appear reasonable to attempt to make all agencies conform to the same standards for treating inventions as deliverables. That uniform treatment was developed by the Kennedy patent policy and extended by the Nixon patent policy–both of which established guidelines for when the government should obtain title to inventions made with government support, and when the government should release its claims to title in favor of non-federal entities acting on the government’s behalf in the public interest, but with the opportunity to recover private expenses contributed to develop an invention to the point of practical application, along with a reasonable “incentive” to make the effort. The lag from Bayh-Dole to the rise of university and nonprofit patent portfolios, as shown in the charts above, is the effect of the delay from disclosure to issued patent (often about four years or so), the implementation of the provisional patent application system (which made it easy and inexpensive to file applications based on a manuscript rather than a fully drafted utility application), and the change in university patent policies to make this new effort not only appear legitimate but to require it as a matter of university contracts. 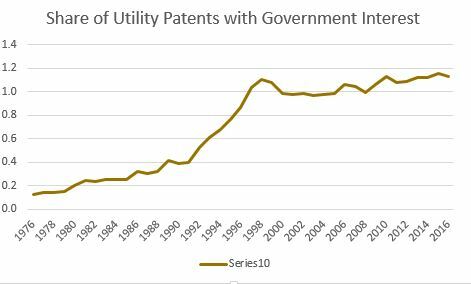 We might then expect to see a rise in government-interest patenting a decade after the passage of Bayh-Dole. And that’s about where we see it. There may be other factors, of course, and by identifying one set of factors, as here, we haven’t ruled out others or even demonstrated that this set of factors has done what I have argued for it. But it is worth considering that Bayh-Dole’s effect has been largely to enable the exploitation of research discoveries at universities to fuel a version of patent brokering that, for all its assertions of promise, in the end has failed to advance innovation in America. The only consolation is that the Bayh-Dole complex of patenting accounts for about 1% of all issued patents. Perhaps this is a crucial 1%, but I think not. We might then consider that it’s possible that even if Bayh-Dole were to be wildly successful, that success would mean next to nothing in the big picture of the United States innovation economy. But Bayh-Dole has not been successful. Universities have accumulated patents that do nothing to promote the use of the underlying inventions and work, instead, to cause companies to avoid those inventions. Perhaps, then, one reason there is not more outcry about Bayh-Dole is that it matters so little, even to industry. It has produced a class of patent brokers with an annoying business model; it has disrupted university collaborations with companies and with each other; it has dried up the public domain, commons, and standards for technologies developed with federal support; and it has undermined public support for universities–if they are going to make so much money from patent positions, then why bother given them tax money that could go to other, more pressing social causes? In this view, Bayh-Dole doesn’t matter to American innovation, though it ought to matter to universities, where its faux implementation by patent brokers has created an expensive social burden of patenting that does not live up to the claimed effects. It is universities themselves that suffer from their habits of patenting under the present model, like drunkards with dying livers. Will they recover? Will they break their addiction and become lucid? Will they find new lives? Will it actually matter in the big picture? All this remains to be seen. This entry was posted in Bayh-Dole, History, Innovation, Metrics, Policy, Technology Transfer. Bookmark the permalink.